Has Your Fraud Team Hit The Breaking Point? Most fraud teams begin with one person responding to customers who are calling because they saw an unfamiliar charge on their credit card bill. Or, maybe a company is experiencing chargebacks for the first time and one person is tasked to learn about the issue. In any event, for small merchants, the process is intensely manual. As a company grows, it may add a person or two, but merchants can gain substantial size without significantly altering the way they fight fraud. This can result in a personal cost for the employees. 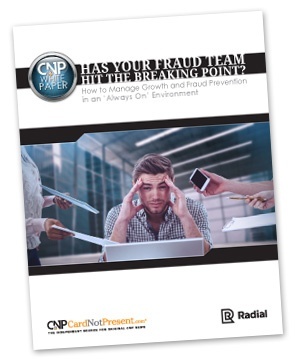 This white paper produced in partnership by CardNotPresent.com and Radial examines how to manage growth and fraud prevention in an 'always on' environment.